← Great deals to share! I’m in the process of a little redecorating project where I’m going to rearrange my bedroom furniture, paint the walls, and spruce things up a bit with new accessories. I already have a blue and somewhat beachy theme going, but I need to tie it all together. I was recently perusing one of my favorite design websites, House of Turquoise, which features this cool, breezy, and calming color in beautiful and awe-inspiring ways. I check Erin’s blog every day to get ideas, and the images she features are simply stunning! Recently I checked out Anthropologie’s website because I love the unique items they have for fashion and home decorating. 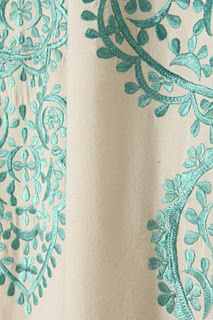 Low and behold, I found the most beautiful curtains that would fit with my theme! These curtains look rich, elegant, feminine, and I love that turquoise color! Look at the detail of the embroidery! The curtains come in a couple different colors, and they’ve received excellent reviews from others who have purchased them. They cost $108-$168 per panel, depending on the length, so they’re definitely not cheap. I think I’ll put some more thought into it, but you may soon see some pictures of my new and improved bedroom. Stay tuned! This entry was posted in decorating, home. Bookmark the permalink. 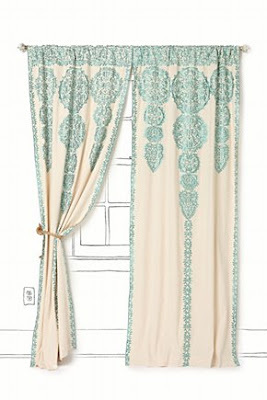 One Response to I want these curtains!